I know blue is the colour for AW14 but my favourite product right now is the green corduroy jacket with trim and deconstructed lining in Liberty print peacock floral print. If I was to get all deep and meaningful about it I’d say it’s another of this season’s nods to the 70s when the “Peacock Revolution” of the flamboyant 60s gave way to calmer men’s style and the deconstructed suit was born. I like the brown and blue variants but I love the green. I have always enjoyed this time of year, as Summer turns to Autumn. The sun sits lower in the sky, there’s more contrast, trees seem to stand out a little rounder. The green of dock, plantains and nettles that have stood all summer darkens and is a little more matt. The transition has always struck me as quite sudden in England. Returning from a latitude as near afield as the south coast of Brittany you notice a difference. There, Summer fades more slowly, late September holds onto warmth. Waves rise higher and the wind starts to blow but it’s a more gradual change. Back home one feels that something has just switched – a quality of light, cooler and fiercer. A noticeable swift chill. 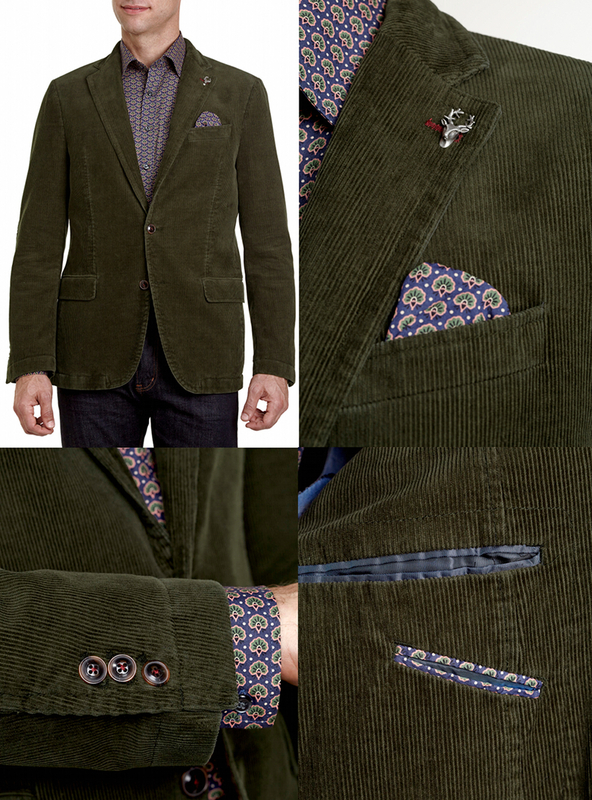 Corduroy is a bit like an old friend who is always turned out well. Smart, familiar and dependable it ticks all the boxes for a fabric that has been around long before there was such a thing as boxes to tick. And there’s something about it that fits the season perfectly. The vertical ribs of corduroy are called ‘wales’ and, being ribs, they play with this oblique light rather well. The colour a little more saturated for it. I can imagine wearing this piece rather a lot over the season and I think, as nature seems to be infiltrating my design work more and more, that I like the green because, now, that colour is nature’s last hurrah, before we move into the cinnamons, reds, coppers and earth tones of Autumn proper. And because I see those cheerful touches of lining and trim as Summer handing over to a mellower season.